Recent release “The Boy with the Hairy Mole” from Page Publishing author William Surles is both educational and innovative; this work explores the ideas of friendship, self-acceptance and bullying. William Surles, an avid reader, sports enthusiast, video gamer, devoted writer and author, has completed his newest work “The Boy with the Hairy Mole”: is about a boy name Hairy, who has a hairy mole on his left cheek, a fun and entertaining work about growing up and overcoming life’s obstacles. Published by New York City-based Page Publishing, William Surles’s enlightening work is the perfect read for children and adults alike! The boy with the hairy mole is about Hairy, who, with the hairy mole on his left cheek, gets talked about a lot. Hairy loves to invent new things, but Hairy’s little sister, Robin, loves to mess up his inventions. Hairy had no friends at school until he makes friends with the new girl named Rachel. Hairy and Rachel team up in the science fair so they can try to beat Thomas. Thomas is the second smartest in school next to Hairy, and Thomas hates being second to Hairy. Find out who will win in the science fair when you read this book. Hairy and Rachel will return in Hairy and the Time Belt. 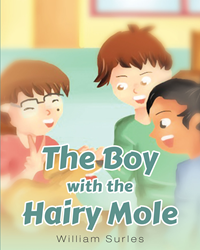 Readers who wish to experience this compelling work can purchase“The Boy with the Hairy Mole” at bookstores everywhere, or online at the Apple iTunes store, Amazon, Google Play or Barnes and Noble.